Home » Gardening » Spring Pruning Tips. Should I Prune Now? Spring Pruning Tips. Should I Prune Now? When to prune? How to prune? When to prune this? When to prune that? People seem so confused by it all. So in as few words as possible I am going to give you my take on pruning. Hey! Do You Have an Extra Square Foot in Yard? Just One Square Foot? Turn it into $93.60 like This! I give it very little thought, I pay no attention to when something it going to bloom or not bloom, I just prune! For the most part I stay on top of my pruning for two reasons. 1. At home, my wife would never let me get away with leaving things un-pruned and she does about 80% of the pruning in our landscape. Then she points me at the things that I need to prune. 2. I grow plants in the nursery for a specific purpose so keeping them pruned as needed is part of the process and if I don’t keep up with it I end up with ugly plants. If I’m walking through the nursery, or the yard at home and see a branch that should be there, off it comes. Most of the time I have a pair of pruning shears in the front pocket of my bib overalls. Doesn’t matter when it is. Spring, summer, fall, dead of winter. If I take a notion to prune it gets pruned right then and there, very little thought involved. Why I Prune My Plants Constantly. If I look at a Japanese maple in my yard or in the nursery and see one branch that sticking way out from the plant it’s obvious that it has to come off eventually. That branch is loaded with buds that will quickly turn into more branches, those branches into more branches and on it goes. But what doesn’t change, is the fact that original branch needed pruning and still does. So any growth that appears on the branch or it’s off spring is wasted growth, wasted energy that could have gone to making the plant better, not exponentially more lopsided. Make a Trip Around Your Yard Right Now. How Do Things Look? What Needs Pruned Right Now? Prune them now. Don’t let those plants put on a lot of growth where you don’t want growth. A loss of flowers if you prune now? Me? I don’t care! I want a nice plant. If I failed to prune it when it needed pruning I deserve to not the see the flowers this year. Okay, let’s see what I have for you on pruning. Things I written in the past. 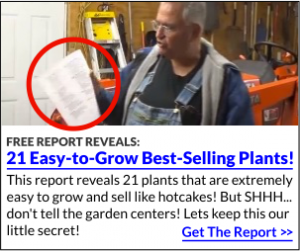 One Finger Pruning? Yes! Especially on Japanese Maples. More on Pruning Japanese Maples. Questions, comments? Shout’em out below. We have Squash Vine borer. They wreak havoc on the Yellow Squash. Charles, I don’t know you’ll have to google it. I think sometimes you might want to leave a branch on for fattening up the trunk of a tree though. From what I understand, I think bonsai growers use this technique. I really need some advise. The rabbits this winter left me absolute carnage. We’d never had a problem with them before but they moved in late last Summer. I had a row of (7) 3-4′ burning bushes that have been completely girdled. What do I do? If I cut them down to 3″ will they come back? This is very demoralizing. They have taken years to grow in our sand soil in central WI. They also chewed up a 6′ dappled willow but I have no doubt that will come back. Help if you can, Thanks! About all you can do is give the burning bush some time. If you cut them back really hard, most likely they will come back but it’s a slow process. You can spray next winter, some use hot sauce and vapor guard so the sauce sticks to the plants. ???? I’ll fence next year along with spray. I’ll cut them back and see. I had about 30 3 yr old ones to sell and they got them too. We’ll just keep on trying.. thanks Mike. I’m so grateful to you for all your rock solid advice over the years and your wonderful ability to strip away the fluff and deliver clear, concise advice. You have a great, warm personality that shines through and creates an instant believability with your audience. We trust your advice, knowing that it is sincere and not profit driven. It’s so enjoyable to read your communiques and see your videos, which comes across like you’re only talking to one of us at a time… a true gift in the communications business. Hi Mike, I’ve learned NOT to do heavy pruning during the growing season. I over did it on a magnolia and it died.. Can’t remove more than 1/3 of the tree at that time. I also learned that after cutting back my Euonymus hedge, I did a lot of pinching back the new growth, making it bushy and thicker. Is that what you call finger pruning? It sure works! Typically when I say one finger pruning that usually has to do with simply knocking the buds off of a tree stem where do not want a branch. Really important with grafted plants. I have a rose of Sharon and it is by a downspout and it is not doing well. How can I save it? Is it getting too much water? Probably too much water, if small enough move it now while dormant. I have a question that I have not had answered unless this article answers them? The jury is still out on that. But I have pomegranate trees that really need pruning and the question is this for me…. What is the maximum that I can prune them back every year. Can I cut them back like I do crepe myrtles which when people see mine they call them crepe murders. But my pomegranates are out of control and and get long and spindly and then when it rains the branches hang over and you cannot even walk by them. When my mom had pomegranates thy had one main trunk and grew beautiful and thick and produced unbelievable but these pomegranates have numbers stems coming up from the root base and I am afraid to cut them off and just leave one. I have no experience with pomegranates but the general rule is you can remove one third of the plant if you do that while the plant is dormant. Then the following year you could go back and remove another 1/3 if you removed the first 1/3 selectively. My rule always is, what’s the value of the plant to the property in it’s present condition? If the value is high then take your chances and cut it the way that you want and hope for the best. When plants are dormant you can usually get away with a lot. Harsh pruning seldom kills a plant. But if they plants were actively growing and you remove all, or almost all, of the foliage that leaves the plant with no way to continue with photosynthesis. If you are going to do it, do it now before the new growth starts. As long as you leave plenty of foliage they should be fine. I have a red haven peach, when and how do I prune and spray? 4 yrs old. Normally I don’t read article on blogs, however I would like to say that this write-up very forced me to take a look at and do it! Your writing style has been surprised me. Thank you, quite nice post. I live south of you outside Youngstown. I have a lilac bush that is as old as the hills and looking bad, how much is safe to prune. I don’t want to kill it but I have to get it back in shape. Love the website and the emails, keep up the good work. Pruning plants is not likely to kill a plant. If your lilac is looking bad now, I’d take the chance if it were me. Thank You for the the handy tips on gardening. My Question is about some very severely neglected Rhododendrons … I’ve seen some cut back to just the bare stump with only a basic shape left to grow from … We will be selling the house … so I am not sure if this is what I need to do… the branches on these bushes are all kind of longish and spindly… I also have two rose bushes … My husband doesn’t believe in pruning… so they have gotten entirely out of hand too .. and they have a bad problem with black spot too … What would be the best thing to do about these plants? I wish you could take a trip out here to Seattle (Redmond) and give me some tips! I would love to turn you loose in my yard! If they were mine I’d prune them both. The Rhododendron can probably be cut down to 50% of what they are now. That kind of pruning usually stimulates new growth and in a year or so you have a better plant. If you are selling the house you have to get rid of that unruly look, it will destroy curb appeal for potential buyers. Also, we have a gorgeous, old Rose of Sharon (about 14′ high) that we’d like to ready for moving, probably during the summer. Is now a good time to get it ready? Or should we wait until right before moving it? Thanks for all the pruning tips! Thanks Mike, Your the man!!!!!!!! This is a great time to trim rose of sharon because they make flower buds after the growing season starts. So pruning now won’t even cost you flowers this season. You have a unique opportunity with my system and a job in the industry. 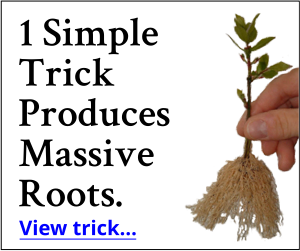 That will put you on the fast track because you are around plants all day long. That’s how learned. Are you supposed to prune Clematis when is dead and still cold? I would. I like to trim things when they are dormant. That way when they start growing all of the new growth counts. That has always made me feel better when I go snipping off branches and twigs based solely on whenever I have the time. Dr Mike: Thanks for the second opinion. I just purchased a piece of property with several apple trees that have become way over grown….what’s the best way to bring them done to a reasonable height and get some apples from them????? Heavy pruning. They need a wake up call. mike i have not been able to prune anyso far this year but i usally prune after christmas while the bushes are dormant and the weather is agreable. the good news to us old timers. So. Calif. Zone 9-10 plants are what we need out here. Help please. The same advice applies, just prune. Hello Mike, Us Wisconsin people might have to wait a bit to prune this year. I still have 6 inches of snow in my yard. I fell in love with trumpet vine because they attract hummers to my yard and I’m have a hard time germating the seeds I took from the one I found on the road any easy tips ? Should I prune ( and how) purple fig trees. I’m not expert on figs, but I’d trim them like any fruit tree, opening up so they get plenty of sunlight inside the tree and air circulation. The one that won’t fruit. Try some pruning. Root pruning could also stimulate it as well. I’ve been in this business for 40 years, everything I’ve learned I’ve learned from professionals. I always have the nicest landscape in the area and all of my friends and relatives who I’ve designed landscapes for, and given pruning advice to, have beautiful landscapes. It’s the lack of pruning that will completely ruin a plant. Anytime the weather cooperates is a good time to prune! I agree with you. I have been cleaning beds and pruning and cutting back and prepping the yard for spring and a new growing season. I am a tall guy that hates it when walking around the yard and branches are hitting me in the face. My rule of thumb if can hit me it comes off. That also allows for more sunlight to the beds. I have over 100 beds and I grow bushes and evergreens that I keep small as not to take over a bed. Pruning back trees allows you to get the starts for new plants but also helps keep things in check and helps maintain the illusion that we control our plants! LOL! Hope you have a good easter as Well! Thanks Casey, sounds like you have a wonderful yard! Most fruit trees are grown as single stem, but encouraged into multi stem just a few feet off the ground. So I think either way would be fine. You can remove all but one of the stems if you like. With Potentilla I cut them back really hard in late fall or early spring. They are a vigorous grower and look unsightly if you don’t prune them hard at least once year. I have a question as to how to prune lilacs. The old owners planted them and now they are about 8 feet tall. How do I do this? Would it be safe to cut back to 4 feet? I would be fine to cut them back to four feet. Ideally do so when they are still dormant which would be right now unless your in a warmer state. when is best time to prune lemon and orange trees? I’m not sure, maybe somebody else can help out with this. The best time to prune cold damaged citrus trees is after the first flush of spring growth. Doing it before will retard new growth. The more you prune grapes the better fruit they produce. Grape growers prune heavily during the winter months. But you can also prune during the summer if need be. I prune my roses on full moon. I thought it was old wives tale but they really begin putting out growth from the base rather than get spindly when you prune them at other times. My Grandfather pruned fruit trees all winter. He had an apricot orchard, and pruned with a heavy hand. I haven’t purchased lately. Love your advise. When your name comes up on my screen, I go to you first. A couple nee things in my yard. Across the front,as a wind breaker. I have giant Pine trees. They were started from the little twigs Mac Donald gave away years ago. They stand 25 to 30 ft. tall. Also, the Electric Co.abandon a pole amongst these trees and I finally got a trumpet vine to climb it. whoooo. It has wrapped around it, so beautiful.Twists, gnarled,arms and legs…A beautiful site. And yes, it has climbed the whole tall pole. Yes, we mow the new vines that pop up all over the yard. Once they are established,they can be a pain. Love it. Gardens can be soooo beautiful if you keep a spot that Mom Nature can have her style. Thanks Anita, I appreciate that. Are you saying that pine trees can grow from cutting some of the branches and planting them? Anita are you saying that a pine tree can grow from one of it’s branches? I love pine trees, I have planted some of seeds from the cones, but they only grow about 2 or 3 inches and then they die. I hope everyone follows your advice, as I planted a crepe myrtle 7 years ago, and it never grows, and never blooms. I guess I never thought I knew how to do it the right way, pruning wise, but probably wrong pruning would be better than nothing. I agree, pruning indecision does more damage than not pruning. Your aunt was a very wise woman. MIKE, Can you tell me how to tell a maile froma female PAWPAW tree? I have seen where it only takes one male for 10 females. They are full grown (15 years) and never produced. Is it the leaves, bark WHAT! Please help if you can. I am in WV.No.easter panhandle. Sorry, Lou, I really don’t know. We don’t grow them here in Ohio. At least not many of them. In female pawpaws (Papaya carica) the flowers and fruit form close to the trunk of the tree. In the male pawpaw the flowers and fruit cluster on little stems that come out from the main trunk. Apart from male and female trees there are also bisexual pawpaws which are self-fertile. If your plants are 15 years old and not fruiting something else may be the problem, as long as there is a suitable pollinator in the neighbourhood (not necessarily your garden) they should fruit. Make sure they have sufficient humidity in summer if you are not in a tropical climate, mist the plants with the garden hose on a regular basis throughout summer. Hope this helps. Guess I need to change my ways. I always put off pruning until that “tomorrow” that is always a day away. Shame on me. Mike I am the same way when it comes to pruning. Because if you wait until the perfect day to prune your bush or shrub will be out of whack.Just Do it :-)because now is a great time. James, I agree. Waiting is just procrastination, then when the ideal day comes it’s too hot, too cold, too windy, I have things to do. Do it now. You’ll be glad you did. Mike, I pruned 2 weeks ago and stuck the peaces in pots around the yard and now there growing. I didn’t thing it would do anything but they did. I now have two peach trees and some almond trees. I might keep them I really don’t know yet. Mike, I have forsyntia which I neglected pruning over the winter. I want to transplat several and of course it would make sense to severely prune them for convenience in handling. But if I do that, I don’t think they will bloom this year (already have buds). What is safe to do with the transplanting? Thanks. Cut those forsythia off and bring in the branches–they’ll bloom in the house. You still get to enjoy the flowers, and then you won’t stress those shortened roots with all of that top growth after transplanting–possibly stunting or even killing the plant. Short roots, short top, live plant. You really don’t have many options. Cut the branches and bring them inside and let them bloom in a vase. Transplant the shrub before it leafs out. How much can I prune off my River Birch? It bushes to the ground so can I prune it up about 3 feet safely? Phylis, Yes, you sure can. Hey Mike! Love your stuff on Gardening but can’t use most of the tips since I live in Phoenix AZ area. Why don’t you do like Jerry Baker (he had a place in Florida)& and buy a place down here & spend the winters gardening here. That way I could use your tips for Zone 9 as well. Most of what I write is usefully in all zones. The only thing that is different are the types of plants, but the techniques still work. What is the latest that you can prune blackberry plants and not loose the fruit for this year. I’m just south of you in Lexington, Kentucky area. Briars are massive and need to be cut. I don’t want to lose this years’s harvest. In October I cut down to the ground all the canes that I picked blackberries from. I had 5 new canes that will produce blackberries this spring. The new canes were thick and huge! Some were as tall as 20 feet high! In October I cut the new canes down to 6 feet tall. I also cut down any side chutes that grew from the canes leaving only a 6 foot thick stalk. Last year I had only 3 canes on my thornless blackberry bush, but those thick stalks grew side chutes about 2 feet long and it turned into a giant thick neatly groomed bush loaded with about 2,000 blackberries. I ate lots of blackberries for 6 weeks everyday. I support the canes with metal poles and wrap wire around in a circle. You must cover the 6 foot thick bush with bird or deer net so the birds and squirrels don’t eat them. This year with the 5 new huge thick cane stalks, I expect about 4,000 blackberries! Can’t wait, and that’s the way I prune my blackberry bush. I don’t know for sure, it could be safe now, not sure when they set flower buds. The ideal time to prune them would be right after they are done producing fruit. When and how should I prune a azalea? I had friend in Wilmington, NC, great azalea country who consistently and very successfully made cutting from old plants and rooted them on July 4th weekend. I asked him why July 4th. His response: because that is when I have time! It’s best to prune azaleas right after they finish blooming. The plants starts to set next year’s flowers shortly thereafter and if you wait too long you won’t have blooms on your azalea the following year. Hum my Mother in Law always called me the ‘mad hatter’ of pruning after I spend the day pruning. She always thought the bushes and plants were ‘dead’ Yet, they all (well most😁j survived.! Lorraine, Right after the finish blooming. See the link at the end of this article. Best time to print hydrangeas?